If a client is ready with a design and measurements, it makes our part of the jobs much easier. 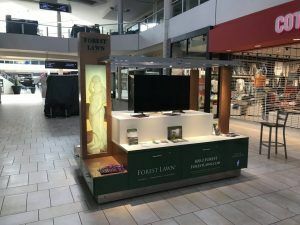 Our longtime customer, Forest Lawn, was creating a kiosk for an indoor mall and they asked us to create and install some graphics for it. They sent us all of the artwork and renderings of what that kiosk was to look like. The elevations showed a cart with a base that was wrapped with graphics all the way around, and two panels with backlit graphics. Detailed measurements were laid out so it was easy for us to figure out the scope of the work. Since we had all of the necessary artwork, the first step was to lay out all of the graphics. We have a large format printer that prints up to 52″ so we need to plan the print ahead of time to orient the different graphics to make sure that there aren’t any seams. This was pretty easy to do since the wrap at the bottom needed to be broken up due to the different sections and drawers. These graphics were just printed on opaque vinyl. For the taller graphics, we used translucent vinyl as they were going to be backlit. If we use opaque vinyl for a backlit panel, the light will not shine through enough. 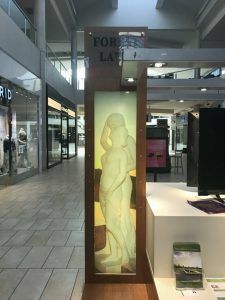 The cart was already finished and sitting at the mall when the graphics were finished so the installation was done at The Shops at Montebello. When installing at a mall, we need to either get there before the mall opens or after it’s closed. As malls have different shops and many patrons, we need to install off-hours to make sure that we are not disturbing any businesses. Especially since the mall cart is in a large walkway, we wouldn’t want to be installing large graphics with a lot of people walking around.